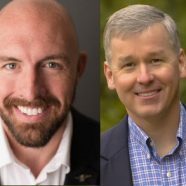 Thursday night, March 29, Georgia District 7 Congressman Rob Woodall and challenger Shane Hazel appeared together for the first and only time. There was a State Senate debate scheduled for 6:30 with the Congressional Debate to follow around 7:30. Shane was out front greeting people before 6pm, Congressman Woodall was not available until right before the meeting. People were clearly interested in the event – the Forsyth County Government Annex was standing room only. Estimates were that attendees wearing Hazel shirts or stickers made up seventy five percent of the crowd. When the debate got underway around 8pm, the audience was instructed to remain quiet and refrain from outbursts, applause or booing, which they did for the most part. Candidates were only allowed 60 seconds to answer a question which moved things along briskly. For the first 15 minutes or so the polished answers and style of Congressman Woodall made him look like the one in control, but very soon Shane’s passion started to come through and it appeared to most that Shane took charge and kept it throughout the rest of the evening. The Congressman had a general theme during the evening – what Mr. Hazel was saying was good in theory, but in the real world things just don’t work that way. Woodall’s thought process came through in several of the statements that he made, as well as disparaging comments about the House Freedom Caucus, blaming them for keeping Congress from being able to make progress on conservative issues. This was clearly the insider establishment candidate versus the outsider, and no place was this more obvious than a comment Rob Woodall made defending the poor ratings that he has from conservative groups. Freedom Works rates Woodall a 27 (Dave Brat, Justin Amash have a 100), Heritage gives him a 72 and Conservative Review gives him an “F” rating with a score of 56. Woodall clearly did not expect the large number of “Yes” answers that came from throughout the auditorium. Congressman Woodall mentioned multiple times how proud he was of his voting record, then made the following statement – “If you give me the chance I will go back and do it again for the next two years.” That comment sealed the deal for many in the room. In the end Rob and Shane shook hands and exchanged pleasantries. Rob’s staff were among the first people to leave the room, and if last night was any indication, the Congressman is in trouble in Forsyth. Shane’s people greatly outnumbered Woodall’s, and we saw people that we have known for years but have never been involved in politics showing up for a debate and wearing “Hazel” badges. Shane and his people have the passion, Rob has the establishment. We will see who can pull it out on May 22.